Caretaker-manager Dave Robertson salutes the Posh fans after a 2-1 win at Sheffield United. Photo: Joe Dent/theposh.com. Peterborough United caretaker-manager Dave Robertson thanked his players, staff and the club’s fans for delivering a special moment with victory at Sheffield United last night (March 3). 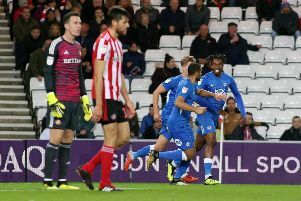 Posh produced an amazing late fightback at Bramall Lane as late goals from captain Jack Payne and substitute Conor Washington secured a 2-1 win. Posh are now ninth in League One, just two points from a play-off place after a second win in succession under Robertson’s management. The Posh comeback ensured teenage defender Ricardo Santos could breath a huge sigh of relief as his error had given ‘The Blades’ a lead they didn’t deserve midway through the second-half. Robertson said: “The reason we work so hard is to create special moments like this, To score a 91st minute winner at a great place like Bramall Lane to beat a top club like Sheffield United is what dreams are made of. “I’m ecstatic, my voice has gone, but what a great night for the club as a whole. The players, the coaching staff and the fans deserved to have a big celebration because this was an outstanding win for us. “There is a real togetherness about the place. We’re all in it together and that includes the fans who were magnificent again. “The reaction of the other players to Ricardo’s mistake is why I love working with this group of players. Ricardo knew he’d made a mistake, but the other lads didn’t get on his case. Instead they supported him as they will support anyone else who makes a mistake. “The response to going behind to such a poor goal was terrific though. We knew we had the ability and the spirit to get back into the game. Most importantly we had the belief. We went 3-4-3 and the lads finished the game very strongly. “Even when we equalised I wanted to keep going foward. I was getting advice that a draw at Bramall Lane was a good result, but I felt we could go on and win and fair play to Conor Washington for that finish. “It was Roy of the Rovers stuff for him. He showed power and composure and that goal should do him the world of good. “We had to dig deep in the early stages to weather a storm from a very strong Sheffield United side, but the lads worked out what was happening quickly and we gave a very good account of ourselves. No-one really expected us to come to Bramall Lane and win - well no-one apart from me and the players anyway! “We will relish this result and we will remember it. We will take confidence from it, but we must not become complacent. The harder you work the luckier you get, but some good planning also went into the game. “We have shown the spirit that we will need to take into the 12 Cup Finals we have left this season. We are in with a shout of the play-offs and we must take advantage, but we have to maintain what we have shown in the last two games. Posh host relegation-haunted Leyton Orient at the ABAX Stadium on Saturday (March 7). A win could move them into the play-off places. A Posh development side hosts Cambridge United at the Nene Park Academy today (March 4).